With kids back in school and the end of summer quickly approaching and I wanted to make sure I had enough of the deliciously sweet corn of the season to last me through the winter so I decided to try a few new recipes. This was the first time I had ever made corn bisque and I must admit, it is freaking amazing!!! Remove corn from the cob with a sharp knife, then use a dinner knife to scrape out the milk for even more flavor! Melt butter over medium heat in a large Dutch oven or soup pot. Add oil, chopped shallot, and onion, and cook until soft and transparent, 4-5 minutes.Add chicken broth, corn, and potato. Bring to a boil, then reduce to a simmer and cook for for 15 minutes until potato is very tender. Remove cobs, add corn and return to a simmer. Cook for another 2 minutes. 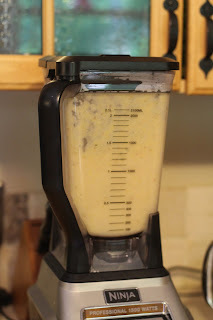 Allow soup to cool slightly, then purée in batches in a blender or food processor until smooth. Place a fine sieve over a medium-size bowl and strain, pressing on solids with the back of a spoon. Discard solids. Return soup to pot, add salt and a generous grind of black pepper. Rewarm over medium heat. Serve in bowls garnished with fresh corn and drizzled with pesto oil. Be sure to let the soup cool for 5-10 minutes before blending. Blending the mixture while very hot can actually force the lid off of the blender container due to the expansion of the steam, causing a huge mess. It also helps to start on low and progressively increase the blender speed. Blend in batches, filling the container about half full. Removing the center insert on the top of the blender (cover the opening with a folded kitchen towel) will also help prevent a mess.